We have worked with companies around the globe implementing Theory of Constraints, Lean and Six Sigma and the constraint is always the same. It’s how we think. In particular, it’s how the business owner or leader of the company thinks. Let me explain some of the common ways our thinking goes wrong and the negative effect it can have on your business. First, at a very young age we are taught to be efficient. And to be efficient, we need to keep everyone busy all the time. After all, our people are the most expensive resources that we have. So we think that in order to maximize our profits we must maximize the use of our resources – people and/or equipment. Now, if you think about it, this really doesn’t make sense. On the one hand if you agree that bottlenecks or constraints exist, then you must also agree that we can’t keep all resources busy all the time. In fact, we can only work at the rate of the constraint. This was a key lesson in Goldratt’s book on Theory of Constraints, The Goal. However, this does not keep us from trying to be efficient everywhere. To be efficient everywhere in the presence of a constraint requires that we put all the work (except what the office is processing) that we have in-house on the floor. Doing this increases the likelihood that everybody, of every skill type, will have something to do and our key equipment will be fully utilized. The end result, however, is that we end up with a large amount of work in process (WIP). And, we all know that the more we have to work on, the longer it takes to get any one job done. This means we are hindering our ability to reduce our lead time and we are making it much more difficult to be on-time. Want to think differently and get a leg up on the competition? Instead of focusing on efficiency, focus on flow. Focus on finishing what you’ve started. In the Velocity Scheduling System (VSS) Coaching Program the first thing we do is cut the WIP. This reduces the number of jobs available to work on. 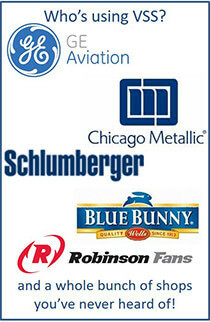 Velocity Scheduling System client ships double in less than 2 months. So, once they stopped worrying about keeping everyone and all their equipment busy, they shipped 2.6 times more! And if you ran the equipment utilization numbers or output per employee, you would find that a nice side effect was that they became more efficient by focusing on flow. When your flow and velocity improves, you have a better chance at meeting your due dates. In addition, the time through your shop decreases which means you can respond faster than the competition. This faster response can be used to actually differentiate you from the competition. But before you go off and start decreasing your WIP, may I suggest that you get the coaching you need to understand all the watch outs and get guidance on how to customize it for your situation? If you’ve read The Goal or any other Theory of Constraints books, you also know that it is tough to implement without a mentor. 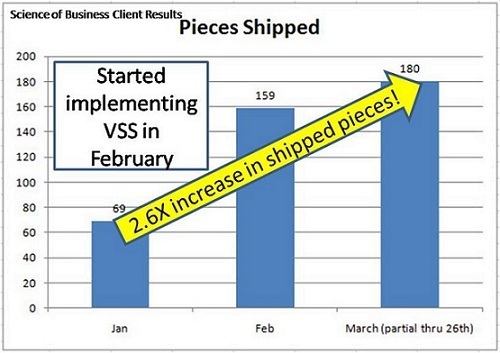 Sign up for a strategy session to see if VSS will work in YOUR custom job shop. Next time we will tackle another one of the ways our thinking is just plain WRONG. Thank God for Apple suggesting that we must “think different” about the business of business. $AAPL is hitting new “two year highs” (well above pre-economic meltdown) with the launch of the iPad. Hope to get mine tomorrow. But I owe a bigger debt to your profound influence. Can everyone be the “next Apple?” Probably not. But I know untold fortunes await those that need your solution and take it seriously. The risk? Zero. Amazing. And yet some may still have reservations. Please alert me to anyone who contacts you, fits the profile for this offering, then fails to sign up. I want to make sure I do NOT do business with an organization that clueless! I am a Textile Engg from I.I.T .Delhi,India. I have been working in vertical of Yarn,fabric,garment and retail.I am implimenting TOC in above verticals in INDIA.I would like to work with you in above verticals.Can you guide me . I started my journey with TOC and am a terribly slow learner. Luckily, I have been able to get good guidance and clients that have benefited from my services. I am unable to scale up and propagate the benefits to more people. Biggest constraint is that they do not know that TOC exists and it can make a dramatic difference. I bought Ch 22 on ‘Mafia deal ‘ proposition. Before I test it out, how can I know if my ‘Mafia offer’ that can make them overcome the resistance to experiment and encourage them to contact me? Thanks. Many of my clients do not know about Theory of Constraints either. But that’s okay. We are not selling TOC. We are selling better business results. If you can help clients get better business results and your offer backs that up, then you’re ready to go. As for getting clients to contact you, well that’s marketing. In all your marketing you need to get clients to realize that they need help — your help. Don’t try and sell your services in your marketing. The objective of your marketing is to get your prospects to realize that you understand their challenges and that you can help. So much so, that they contact you. I’ve watched your free webinar and I’ve noticed that pharma R&D is much like a custom job shop. I was wondering if you have any experience with or have heard of similar TOC implementations in this industry? Yes, the concepts can also be used in Pharma R&D and I have worked with a big Pharma company. I would need to know more, to guide you further, but also check out http://www.ProjectVelocitySystem.com and see if you relate even more to that video. After that, sign up for one of the strategy sessions and we can talk to see if there is fit. Next post: Custom Fabricator Scheduling Success!